Large manufacturing plant in GA that was recoated 18 years after initial foam roof was installed. New 10-year warranty issued. Older foam roof on a warehouse in Springfield VA. Section on the left was recently repaired & recoated. PUFF’s Spray Polyurethane Roofing (SPF) and coating systems can easily last 20 years or more with proper maintenance. At the end of the warranty period, the roof can be repaired, if needed, and recoated to extend the life and warranty period. 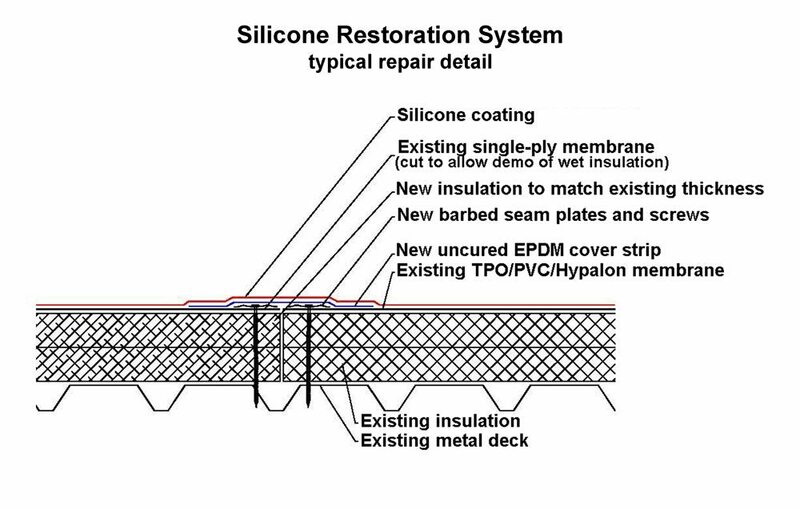 Repair of minor membrane damage. 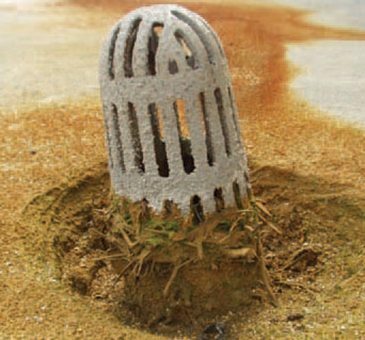 Damage to be repaired includes punctures, splits and wear-through of coating (exposed foam) to the insulation. All repairs not to exceed 1% of total roof area. Inspection of all flashing. Seal any open flashing. Inspection of blisters and/or delaminated roof areas. If these problems exist, they may not represent a potential leak problem. If the contractor determines that a blister has a strong possibility of creating a leak within a twelve month period, the blister will be repaired. Blisters to be repaired plus other repairs as part of this maintenance program will not exceed 1% of the total roof area. All repairs guaranteed for 1 year. Do you have damage or leaks in your SPF roof? Our technicians diagnose the problem and offer solutions to restore your roof to worry-free condition. Insures that your roof will continue to provide trouble-free performance. Allows you to continue your warranty for an extended period of time. Avoids costly tear-off and replacement fees. Reduces waste and further overburdening landfills. Maximizes your roof investment, as recoat costs are typically half of the initial application cost of your foam roof. As an early detection system, roof maintenance programs are an excellent way to service your roof for those non-warranted items that can wreak havoc with your roofing system. For a minimal fee, minor repairs can be fixed long before they become a costly, major repair project. How do SPF roofs get damaged? Although one of the most durable roof systems in the industry, SPF roofs can be damaged from hail, debris hitting or falling on the roof, improper repairs, and from other trades working on the roof. How do you repair SPF roofs? Most small dents, cracks, blisters, or punctures can be easily repaired with an elastomeric sealant. Larger damage can be repaired with a reapplication of SPF and coating in that area. Will PUFF, Inc. repair my roof even if they did not install it? Sure, as long as it is not under warranty by another manufacturer/installer, which may void the warranty. How often should I recoat my roof? It depends on the existing coating thickness and the terms of the existing warranty, if any. We recommend that the recoats happen in the first year out of the warranty period. The best way to keep the roof performing optimally is to participate in the annual roof maintenance program. Under the program, the roof is typically inspected and maintained semi-annually, and the time for recoating can be identified before problems arise. Can I get a warranty on a recoated roof? Yes. Any repairs needed are made as part of the roof recoat process, bringing the roof surface back to “like new” condition. Then, depending on the coating thickness, 5-, 10-, and 15-year warranties are available. 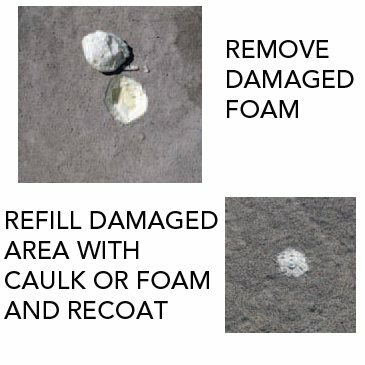 Damaged foam can easily be repaired.